I got a month's paternity leave when the Tadpole was born. This is not necessarily a French thing, since the international agency I work for is not bound by French labor law (something they're probably very pleased about, given the remarkable rights given to workers here). Of course it passed all too quickly, and I didn't accomplish a tenth of the things I had hoped to during that time. That's the problem with paternity leave: It involves taking care of a newborn. 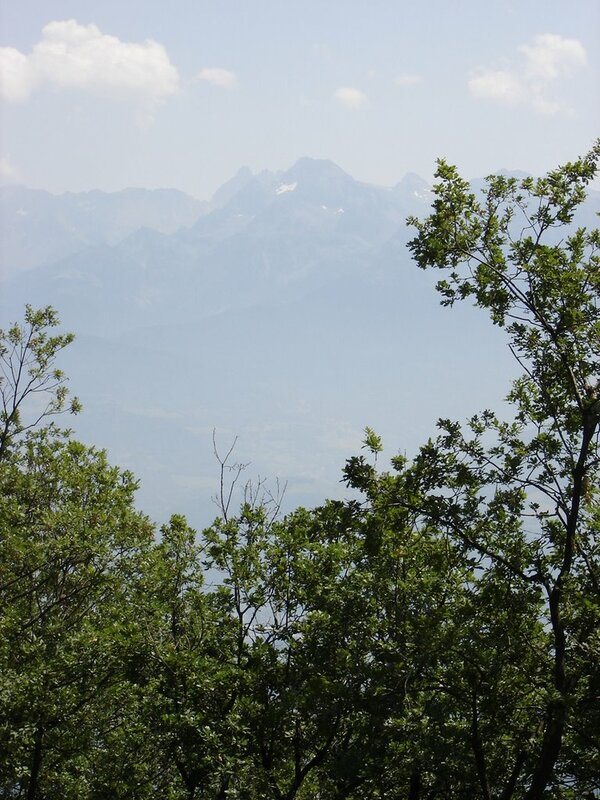 But I did manage to take a full day to take Boog to Grenoble to do some hiking in the Alps. 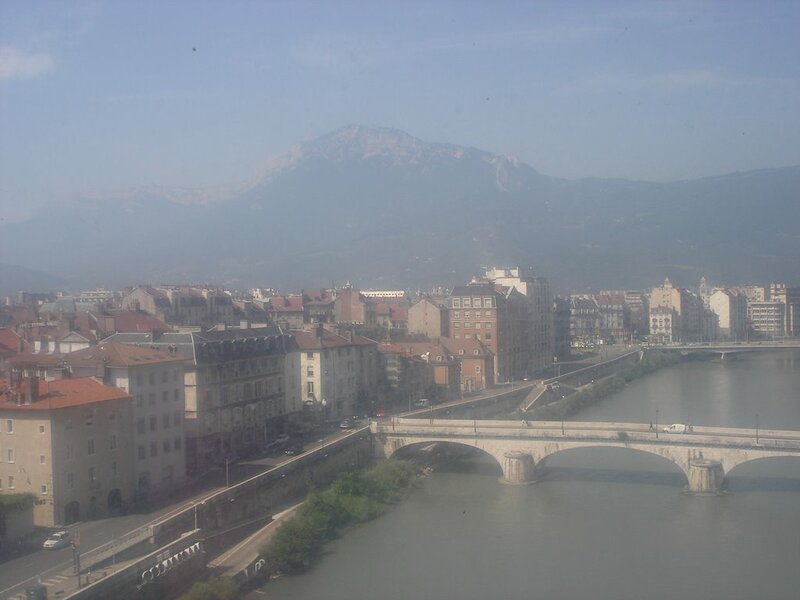 I figured it would be nice to get some relief from the blistering heat as well--unfortunately it turned out to be the hottest day of the year, 96 degrees at street level in Grenoble and 90 or so in the mountains above town. 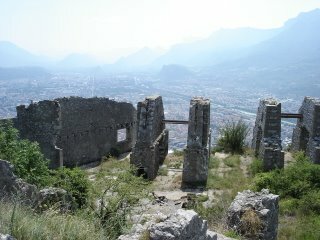 Grenoble's about 90 minutes from Lyon by the slow local train that stops at every two-bit burg in between. It's less than an hour by TGV (which can't get up to full speed given the curves and grades necessary), but that only runs twice a week. Trains are really the way to go for intercity travel in France, especially given the cost of gas and autoroute tolls. They're clean, inexpensive, and they run on time; add to that the essential bad-assery of the TGVs--which sometimes pull into the station with birds splattered on the windshield--and you've got an easy, hassle-free trip. Usually. 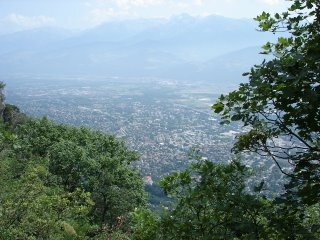 Grenoble is the "capital" of the French Alps, a small city not too deep in the mountains; I knew the name from old Peanuts cartoons (that's where Snoopy wanted to go ice skating with Sonia Henie for the 1968 Winter Olympics). It reminds me a little of Asheville, NC, comparable in size, attitude (and altitude), and status as home base for activities in the surrounding mountains. Maurice Stendahl said of Grenoble, his hometown, that every street ends in a mountain. 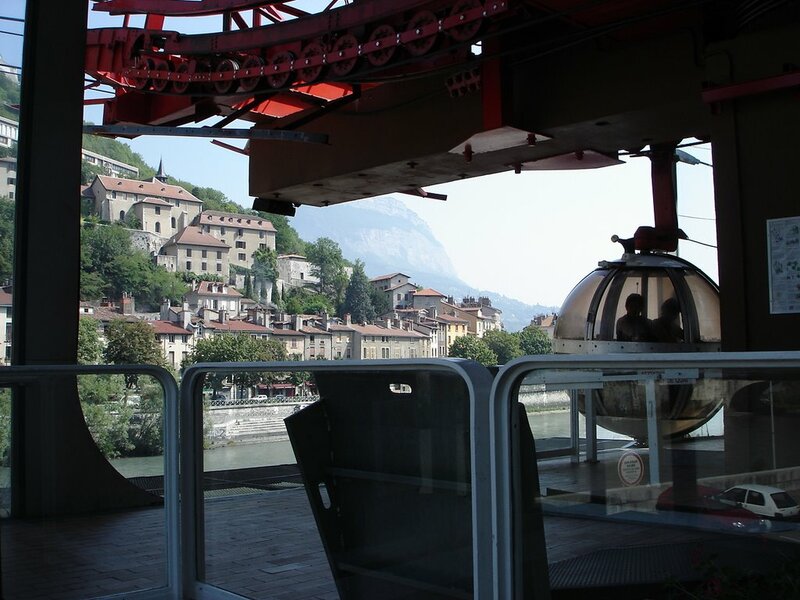 That's pretty much true--there's a cable car running from smackdab in the middle of town up to the Bastille, the old fortress at the top of the Chartreuse Massif that overlooks (overhangs, really) t he town and the Isere valley. The cable car is really a series of six-seater plexiglas balls, like Christmas ornaments...not for the acrophobic. This is Grenoble and the Isere from the cable car, hence the fuzziness. The mountains are this close on all sides. This is Grenoble from the Bastille. 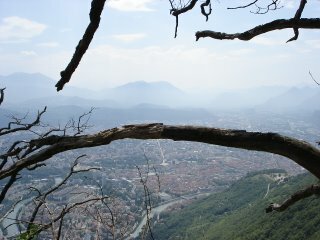 From here, we turned around and started climbing. Back in feudal days, each French lord's territory was divided into individual parcels for the farmers, with narrow paths in between each leading to the town centers, to water sources, etc., so each farmer could go about his business without tresspassing. If you fly over France, you can still see the way lots were laid out: long and narrow, each with a little bit of frontage to these paths. 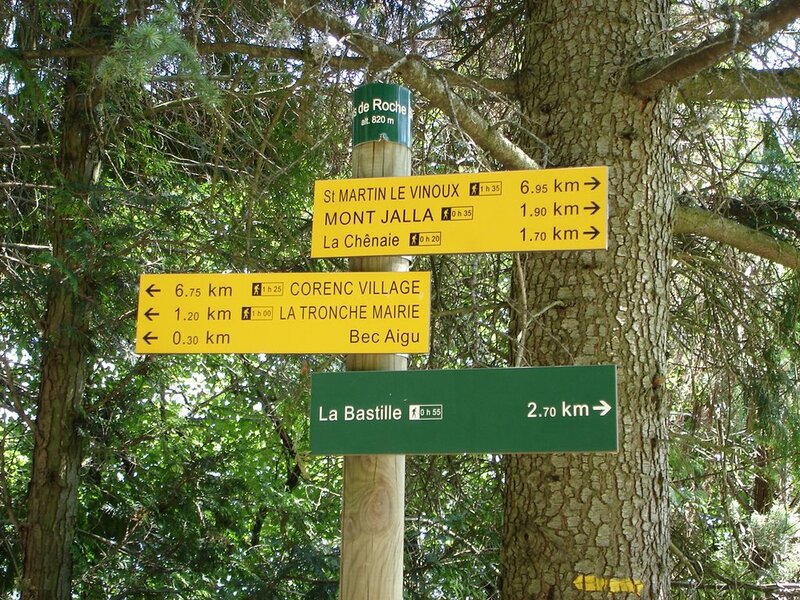 After the revolution, these paths really belonged to nobody--but someone in the government had the foreseight to turn them into a massive system of well-marked and well-maintained public trails, called the Grandes Randonees (the Big Walks). 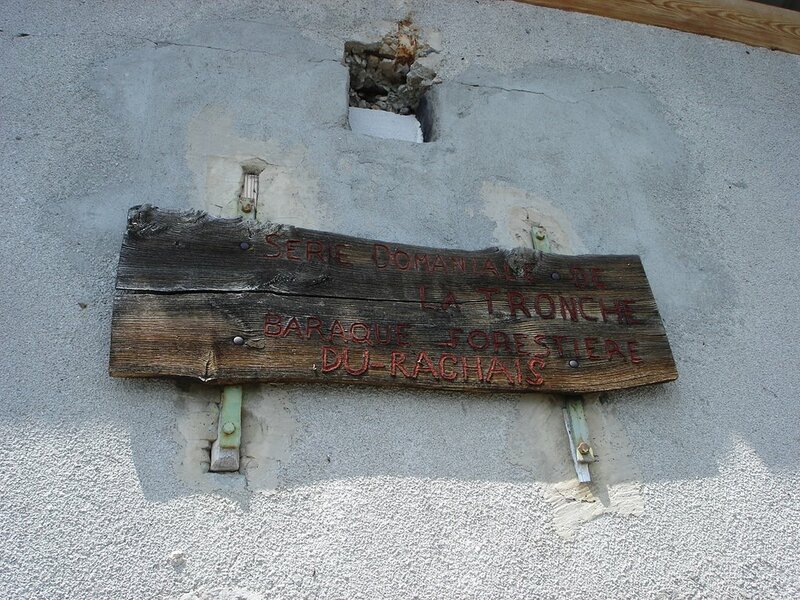 Imagine the Appalachian Trail, only fifty times over and interconnecting every region of France. 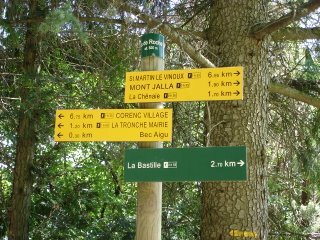 If you had the time and the inclination, you could walk from Nice to Normandy without ever setting foot on a road. Boog and I were taking the GR9, which connects Grenoble to Annecy, crossing the Chartreuse Massif at about 6000 feet. Even though this was a 96-degree day in late July, there was still snow visible on the northern faces of the peaks (top center). 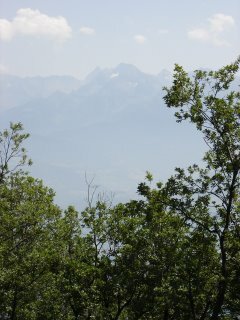 The Isere Valley from above. 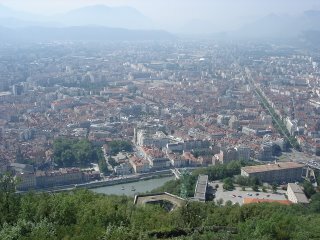 The flat area at bottom right was the old parade ground above the Bastille. We stopped near here for a picnic lunch of saucisson sec (dried sausage) and the local Tomme de Savoie cheese, plus a PBJ sandwich and Elmo fruit snacks for Boog. 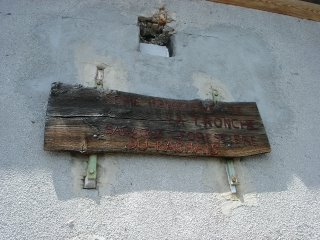 Weather-blasted sign on a trial hut (closed for the summer season). 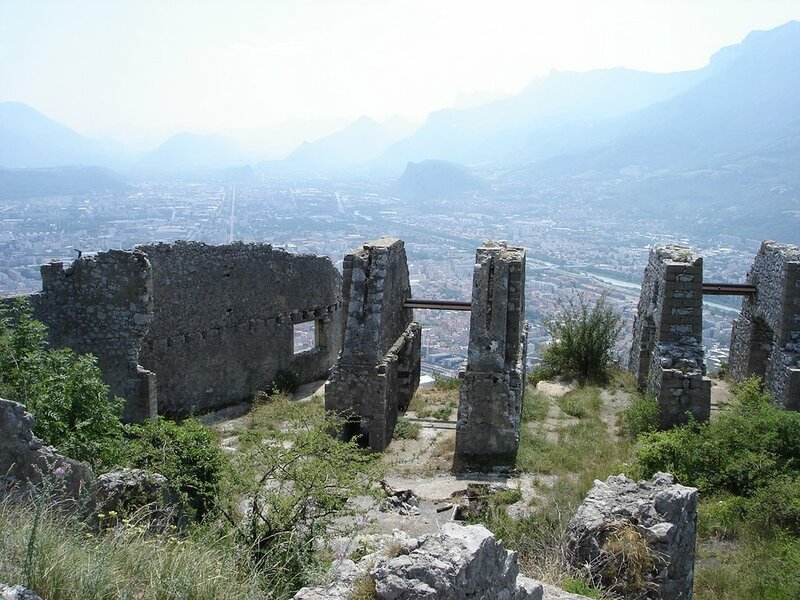 We stopped short of our objective, a mountaintop castle, as we were running short of water and I was uncertain of Boog's ability to make the final climb--I'd had to carry him up some of the steeper, rockier parts. Still, we had made a good full day of it; Boog crashed out at the Quickburger in the train station and I carried him on the train over my shoulder, like a sailor with his seabag. There is a large group of demonstrators carrying a giant Lebanese flag down my street right now...I'd better go take some photos. someone got their internet connection...look at all the pics, yay! 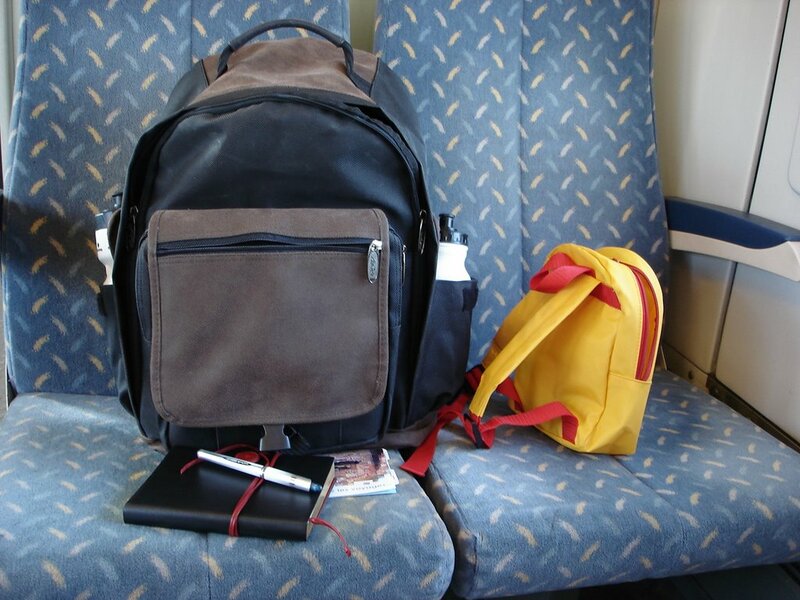 i love the dual-backpack photo. cute!